Each state has its own requirements for professional engineers' license renewal. Most states require professional engineers to complete a minimum number of continuing education hours. Continuing education hours should assist the engineer in maintaining or improving their skills in their area of expertise or professional practice. Most states allow the engineer to make the determination as to which events meet the requirements for continuing education. For the specific requirements in your state, please consult your state's engineering licensing board or review your state's regulations on professional engineer licensing. Most states require licensed professional engineers to retain records or the training events used to meet their continuing education requirements. Advertisements and certificates of completion issued by the CTT provide all of the information necessary to meet these requirements. If, however, you are missing either a certificate of completion or required information for a specific training event, contact us and we will work with you to provide the necessary information. 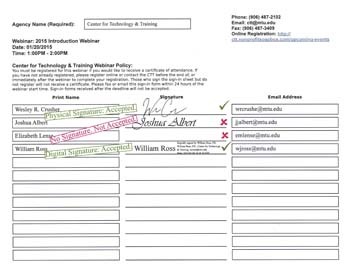 The Center for Technology & Training recommends using this Continuing Education Hours Log Sheet to record the training details. Please verify the information required by your state and, if necessary, record any additional information that your state may require. Be registered for the webinar through the CTT’s office or website. Registration needs to be completed before the end of the webinar. Each registration will include the applicable charges for the webinar, regardless of how many connections are used. Have their attendance verified by filling out the sign-in form (shown below). This form will be available as a PDF download in the File Share pod at the beginning of the webinar. It must be signed and returned (email or fax)* within 24 hours of the webinar start time. The CTT often produces recordings of webinars and conferences. However, the CTT only issues certificates for live events; the CTT does not issue certificates for watching recordings of webinars or training videos.